The full paper is available here (or here if you don’t have academic institutional access), and the purpose of these blog posts is to summarize the method and discuss the implications and limitations of the results. 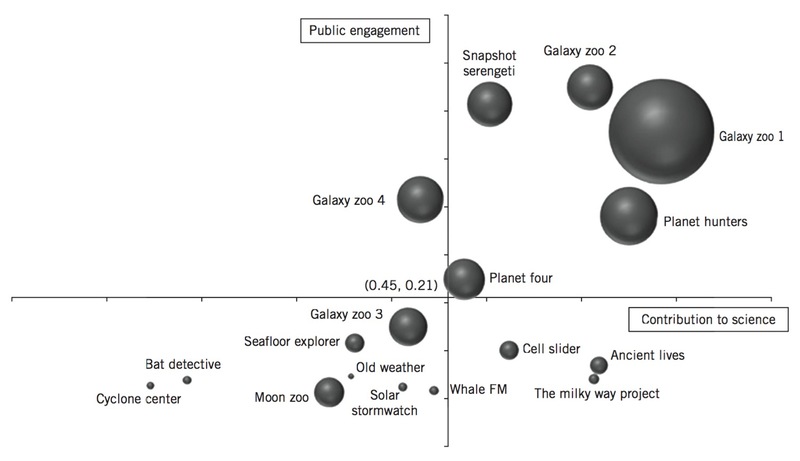 The overall goal of the study was to combine different quantitative measures of Zooniverse projects along 2 axes: “Contribution To Science” and “Public Engagement”. In order to help compare different projects, our study controlled each of these measures for either the project age (time period between the start of the project and now) or duration (the number of days the project was actively collecting classifications), depending on which was most appropriate. the amount of time someone would have to work as a full-time employee to produce the project’s classifications. Additionally, we collected some measures that we didn’t end up using, such as the fraction of forum/Talk threads that were conversations as opposed to single comments, the typical length of forum/Talk posts, and various measures of the popularity of project blogs and social media accounts. While we’d like to include these in a future analysis that allows for additional nuances, the idea behind this study was a clean aggregation and combination of relatively straightforward quantitative measures. The ABCD categories are: Galaxy Zoo, Other Astronomy, Ecology, and Other. The reference to Old Weather throughout this study is actually to the latest Old Weather project, which began collecting classifications in mid-2012. I’ll discuss Old Weather in much greater detail in part 2. 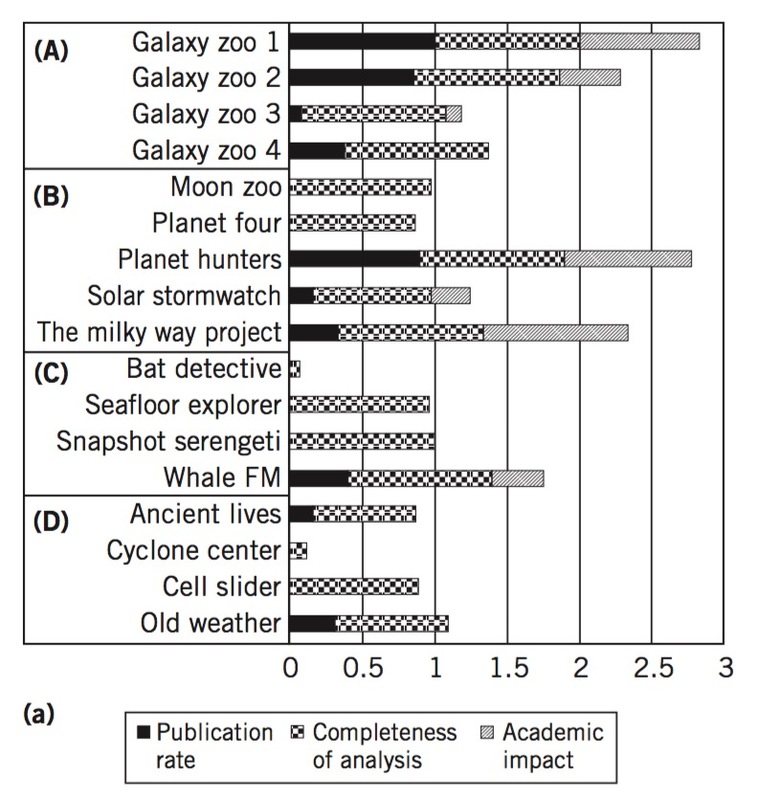 This is the Zooniverse Project Success Matrix from Cox et al. (2015). Note that the drawn axes represent average values, not zero, and anyway the numbers themselves are more or less meaningless because measures of different units were combined and everything has been normalized across projects. 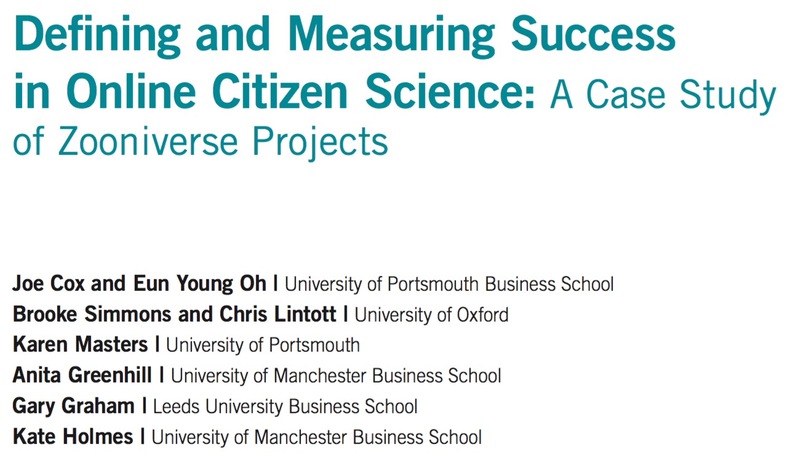 In the next post, I’ll discuss some of the implications and limitations of this way of measuring project success.